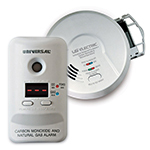 The USI Electric MDS107 Smoke and Fire Alarm responds quickly to both fast-flaming and slow-smoldering fires to protect your family against deadly threats in the home. Perfect for new or replacement installations, the 120V AC hardwired alarm is suitable for houses, apartments and mobile homes. Universal Smoke Sensing Technology responds 87-percent faster to slow smoldering fires and responds quickest to fast-flaming fires. The alarm is fully interconnectable with all USI and Universal 120V alarms using existing wiring and mounting. Auto sensitivity calibration provides superior nuisance alarm protection and creates consistency in alarm sensitivity. This alarm has additional automatic features including a self-diagnostics check to ensure proper operation, a sensitivity adjustment for changes in temperature or humidity and an end-of-service life warning that sounds when it's time to replace the battery. The 9-volt alkaline battery (included) continues protection in the event of a power outage. This alarm features a front-loading battery drawer for replacing the battery without removing the alarm from the bracket. Mount the bracket to any standard wiring junction box and use the large mounting base to cover imperfections in drywall. For maximum protection, install an alarm inside every bedroom, outside every sleeping area and on all levels of the dwelling. 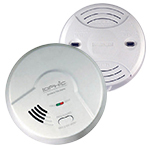 The USI Electric MDS107 Hardwired Universal Smoke Sensing Smoke and Fire Alarm comes with a 10 year limited warranty. Product Dimensions (W x H x D): 5.75 x 6.70 x 1.75 in. This alarm really works. It does respond well to even a small amount of smoke. I accidentally burned some food on the stove top and the alarm about 20 feet away started blaring. The only thing to realize is the potential for the smoke to get trapped inside an interior compartment of the alarm itself. The alarm will keep blaring if you reinstall it. When this happens there is no way to blow out the trapped air and the alarm must be replaced by a new one. This, however, could be true for any smoke alarm. Overall this alarm does work very well. Nice to see that the pin connection remains unchanged from 2011. But for some reason the clamping system has changed from prior model so the ceiling mount needs to be replaced with the new one provided to re-attach the unit to the ceiling. Easy install and so far have worked good without any false alarms. I'm very pleased with my new Smoke/Fire alarms. Easy to install and test. Good product! I discovered the USI Model 1204 Smoke and Fire Alarm Detectors in my home were 5 years beyond their 10 year lifetime! From information on the detector, I contacted USI, Inc. and was promptly sent an email that contained a video link on replacing the detectors. The link answered all my questions. Hence, I immediately ordered 6 Ea. MDS107 Smoke and Fire Detectors that arrived about 5 days later. I replaced and tested all 6 and they worked perfectly in our alarm system. The efficient assistance provided by Michele Metcalfe at USI, Inc., Owings Mill, Md was superb. Thanks for excellent customer service. First time ordering but was very happy with the quality service. Very pleased with warranty support from my old house. I changed out all outdated models in my new home. Simple swap out from one manufacturer to another. 2 mounting screws and a pigtail. Also comes with battery so it's good to go. I recently bought 10 new hardwired detectors to replace my existing USI detectors that aged out. The new ones installed quick and easy. No issues with any of them. I am happy with my purchase. Installation of new smoke and fire detectors was simple and easy, mounted to existing boxes with ease and rewireing was also simple. Well satisfied with my purchase! Four units boxed together for shipping. New 9-volt battery included in each unit. Relatively easy to replace / install. MDS107 is well designed and engineered. Battery drawer is a wonderful design change over my original USI detector. Original detectors manufactured in 1999 or 2000. If offered, I would rate my MDS107s as a 6 - Outstanding. The alarms installed wonderfully easy. They are great. Best option as CO should be monitored down low, not on ceiling. Easy installation. Replaced whole home hardwired ion alarms that were over 10 years old for my parents. Have these alarms in my home for a few months now and am well pleased. Learned from research that photoelectric alarms provide needed coverage in addition to ion technology alarms. 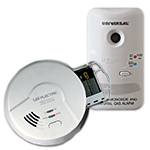 These are among the best priced alarms that have both types of sensors. Your service was excellent and everyone I spoke with was very helpful and professional. It was a pleasure doing business! Had 15-year old USI products and decided to replace as they were long overdue. Good price, fast shipment and super easy install. We bought four at once and are very pleased. They shipped quickly and were easy to install.